Comfort From a Company You Can Trust. When it comes to your home, turn to a company built with integrity and guarantees their work is done right. Whether you’re looking for a trusted heating and air conditioning service technician, electrician or plumber there’s just one company you need to know, Bryant. Bryant has been in the business of keeping Lincoln and surrounding areas comfortable since 1952 all while making customers’ trust and satisfaction a priority. 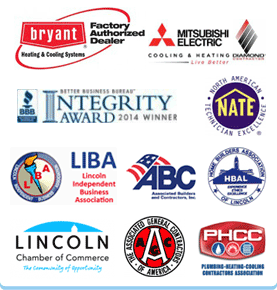 Every one of our heating and air service technicians, electricians and plumbers work hard to provide the best customer service experience possible and as winners of Lincoln’s 2014 Better Business Bureau Integrity Award, we know these efforts have not gone unnoticed. Choose Bryant Air Conditioners, Heat Pumps and Furnaces for Guaranteed Comfort. Bryant is confident in our work, which is why we offer, in writing, a 24-Month “Test Drive” covering new Bryant Heating & Cooling Systems brand residential heating and air equipment. If you are not 100% satisfied with the equipment we have installed or the services we provided after 2 years let us know and we will remove the system and reimburse you 100% of your investment. A guarantee like this only comes from a company you can trust!